The 40 Winks Comfort Perla Mattress can be used as a comfy pet mat on its own or as the perfect liner for Plastic oval beds or Wicker baskets.This padded mat has a cosy polyester faux fur fabric upper and a colour contrasting cotton bottom. Please note: Colours are randomly allocated so you may get any one from the picture. The Comfurt Perla Mattress can be used as a comfy pet mat on its own or as the perfect liner for Plastic oval beds or Wicker baskets. 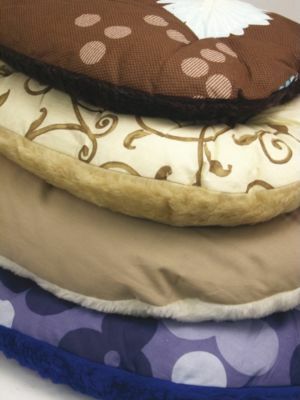 This padded mat has a cosy faux fur fabric upper and a colour contrasting cotton bottom. Can be machine washed at 40 degrees. Unfortunately we are unable to offer a colour choice for this product, therefore please allow our warehouse staff to select one for you. Below are some recent questions we've received regarding 40 Winks Comfurt Perla Dog Mattress, including answers from our team. Can this cushion be washed in a washing machine and at what degree? This item can be machine washed at 40 degrees. Can you choose your colour? Are you able to choose a colour or do you send out a random one?? The colours supplied are randomly allocated so you could receive any colour which is shown in the picture.